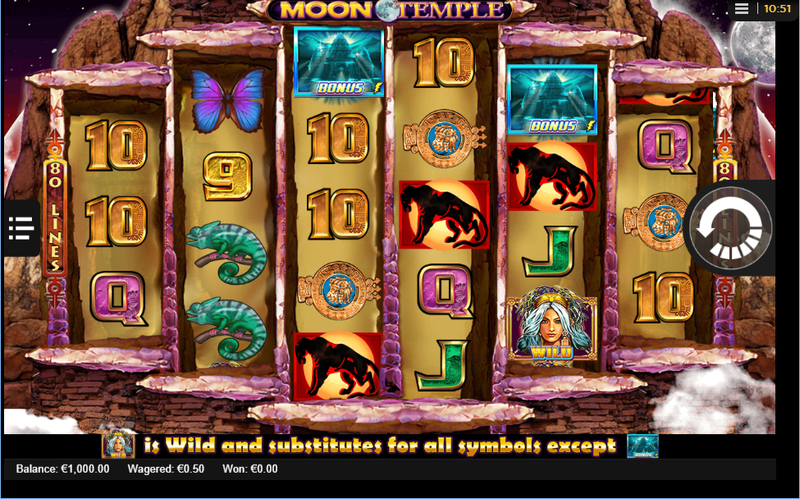 Moon Temple is a Goddess-themed slot from Lightning box games, consisting of 6 reels and 80 paylines. The row format of the reels is an unusual 3-4-5-5-4-3, reminiscent of some of the IGT slots Siberian Storm and Hexbreaker 2. The backdrop of Moon Temple has a stone structure, as you might expect. The reel symbols include the standard lower paying card symbols Q-J-10-9 as well as necklaces, black panthers, chameleon and butterflies. The Wild-haired Priestess is the Wild, which substitutes for all symbols except the scatter. If and when the lightning strikes and you see at least 3 scatter symbols in view, you’ll will activate the feature. This is a two-part bonus feature starting with initial 8 free spins - referred to as the Collection Game. There are (+1) symbols in the Collection Game which will reward you with 1 Moon Spin each time it falls onto the reels. There are up to 6 Moon Spins available on each or every free spin with a possible 48 available! Throughout the Moon Spins, the black panther symbol is Wild, joining the Wild-haired Priestess - therefore doubling up on Wilds and they can also appear stacked. The big downside to the feature is that there is no chance for it to retrigger. 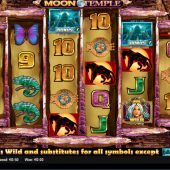 Moon Temple slot is an interesting slot to look at, offering something different to the typical 5x3 grid. It also has a very enjoyable 97.00% RTP, one of the highest around. Beyond that though the slot is not overly enticing, being low to medium in volatility and no rejiggers in the feature can mean wins fizzle out quite quickly. If you enjoy this sort of theme then you could try Montezuma from WMS or their other title Lunaris.